Get an extra BOOST from your soaps! Our goat milk is packed full of essential nutrients and vitamins. Our local, farm-fresh made goat milk soaps contain vitamins A, D, C, B1, B12 and E, which feed the skin and are absorbed into the body, all helping to hydrate and nourish on a very deep level. Our soaps are softer than most on the market, and as a result, we’ve found them to be the best formula to benefit your body, no matter your skin type. All of our soaps are made from the highest quality, organic, health promoting vegetable oils and butters, forming a full luxurious lather. Each bar contains our farm-fresh healthy goat milk, olive oil, coconut oil, shea butter, illipe butter, almond oil, a wide variety of exquisite pure essential oils, then enhanced with our special biofeedback frequency combos to give you the ‘next level’ of beneficial healing soaps, supporting general vitality, good health and wellbeing with everyday use. This is the first soap of its kind and we’ve had so many folks who have experienced the benefits and come back for more. Thank you for loving our soaps! Because we only use the best of ingredients, your skin feels moisturized and not dry or stripped of oils! And since we do not use animal oils, our soap rinses clean and leaves no ‘soapy film’ feeling behind. Our rich moisturizers assure soft skin without itchiness or oiliness. We guarantee you a completely satisfying soap, making your skin smile! All our soaps are enhanced with a special combination of biofeedback frequencies that support the body’s vitality in many ways! Being an advanced quantum biofeedback therapist for many years and working with numerous clients balancing their specific health issues, helped to formulate our soap recipes to include an EXTRA BOOST for supporting better health. These are the only soaps in the marketplace which have these additional qualities. The enhanced combinations stay boosted until you finish with your soap, and no special care is needed to maximize special qualities. The more sensitive you are to these subtle frequencies, the more you will feel them supporting you. 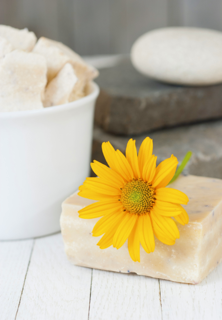 Both fun and exciting to know that there’s more to benefit you from using our soap blends. Not just your Grandma’s same old everyday goat milk soaps! Yes, welcome to the next level of luxury soaps which have been specifically formulated using our unique feature of biofeedback frequencies! This natural beneficial component in our formula, gives an exciting extra dimension to our soaps. This ‘energetic focus’ or ‘attribute’ becomes part of each soap we create for an incredible one-of-a-kind bath experience! With regular use, you wil notice a difference! There’s no other soap like it… promise! Why use our soaps? Need a few more reasons? Goat milk reduces skin inflammation due to its fat molecule content. The cream present in goat milk is a moisturizer, soothing dry and damaged skin, possessing an anti-inflammatory effect. Studies now show that goat milk is effective for treating a variety of skin conditions. This is primarily because goat milk has anti-bacterial properties that delay the growth of microbial organisms that have a negative impact. Our recipe is chemical-free, thus non-toxic to your body. Please remember to watch out for these harmful ingredients that appear in other skin care products and do not use them. They are very harmful to your health and wellbeing. Goat milk soap delays signs of skin aging due to its high content of alpha-hydroxy acids, such as lactic acid. Alpha-hydroxy acids break down dead skin cell bonds, removing dead skin cells from the skin’s surface and leaves behind new cells on the surface that appear smoother and more youthful. Water-based soaps, on mainstream supermarket shelves, use harsh chemical acids to break down skin cells. The lasting effect of chemical acids on the skin is more similar to a chemical burn. Alpha-hydroxy acids found naturally in goat milk, work with skin instead of breaking it down and aging it further. Goat milk contains many vitamins, but is particularly high in vitamin A, which is necessary to repair damaged skin tissue, maintaining healthy skin. Water-based soaps can be ARTIFICIALLY fortified with vitamins, but most aren’t. Goat milk also contains important minerals for the skin such as selenium. Selenium is believed by scientists to have an important role in preventing skin cancer and can also help prevent skin damage. And now… what about our loving pets! Our goat milk soap for pets helps with most skin and coat issues… from allergies, to dry skin, to stress, to fleas… to just time for a bath to get that shiny coat back and happy smiles too! 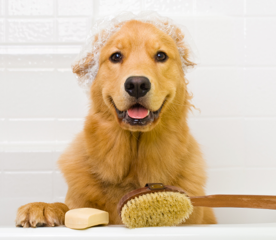 Use our pet wash soaps for all kinds of pets you normally bathe. Our soap cleans well and is soothing, healthy, non-irritating, plus completely non-toxic. Your pet will completely enjoy bath time! Everybody get an extra BOOST from your soaps!